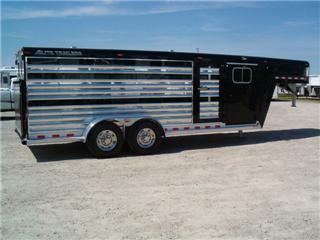 Search an extensive online database of numerous new and used Elite horse trailers, living quarters, and livestock trailers for sale from Elite Trailer dealers and several private party sellers. After 45 years of combined experience in aluminum trailer manufacturing, Elite's founders recognized a need for a product quality that was not yet being provided. In 1995, Elite Trailer was formed, dedicated to producing the highest quality aluminum trailer available to the market. Young enough to still be aggressively growing but old enough to be an established presence, Elite Trailers produces the finest built, all-aluminum trailer available today. Supported by over 200 skilled and dedicated employees, the founders continue to manage and oversee the business on a day to day basis. Due to demand for product, Elite Trailers opened its new manufacturing facility in 2003. This combination of experience and dedication proved immediately successful and Elite was soon honored as one of Oklahoma's fastest growing businesses. Facilities and production expanded rapidly as demand for Elite's enhanced quality trailers increased through their growing, select, dealer network. Currently marketed throughout the United States and Canada, Elite continues to grow at a rate far above others in the industry and carries on a brisk physical expansion plan to meet both current production plans and those of the future. 3Photos.jpg Every Elite Trailer is designed and manufactured to the individual customer's specification. Elite build a wide range of gooseneck and bumper pull products, from horse and livestock trailers to motorsports and cargo. Common to all their trailers, of course, is their commitment to the highest standards of quality Elite's employees take great pride in their workmanship from design to completion and their facilities are modern, clean and well-maintained. Our reputation hinges on the attention to detail before any trailer leaves the lot, Elite's highly experienced, Quality Control Specialist's will ensure it conforms to customer needs and desires and to Elite's standards of comfort, safety and quality. From a distance, most trailers look similar; at Elite we invite you to look closely at our trailer to discover The Elite Difference.